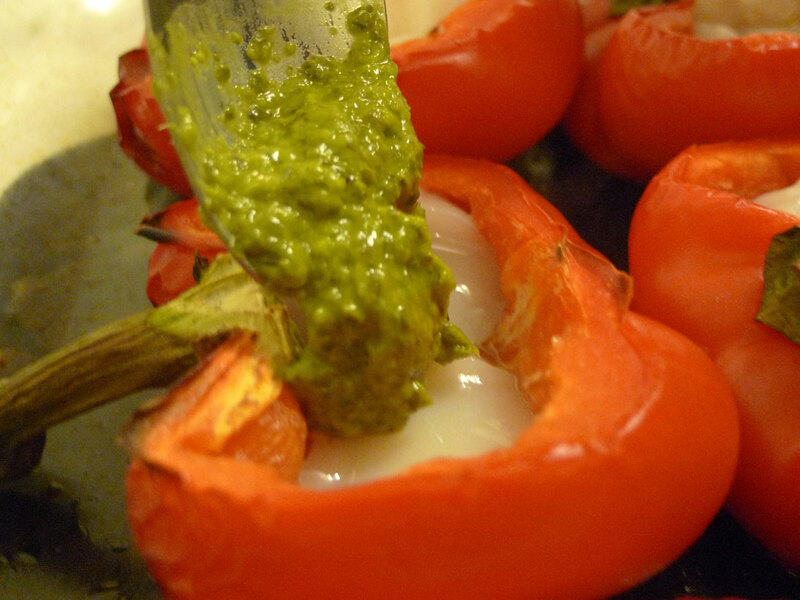 Scallop-stuffed Roast Bell Peppers with Pesto | Two Guys In a Cucina! 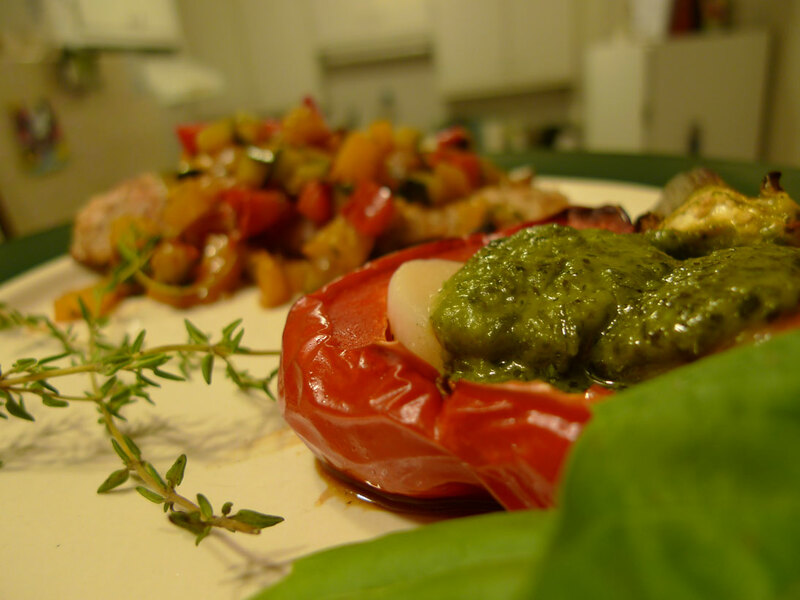 Scallops, roasted bell peppers, garlic and pesto?!? What more can you ask for in an entrée? 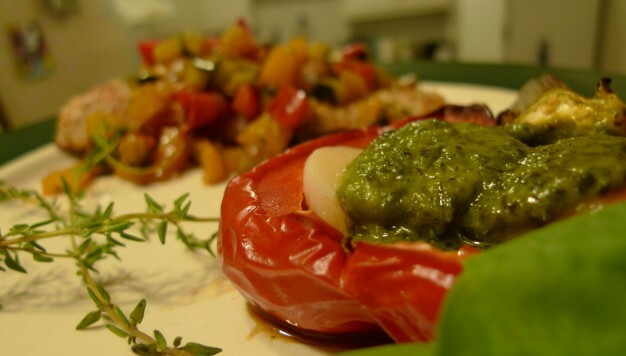 This tasty delight is quite simple to make and your taste buds will thank you. We’ve made these babies twice now and are pretty much no brainers that will allow you to impress with a colorful presentation as well as great taste. Enjoy the recipe! 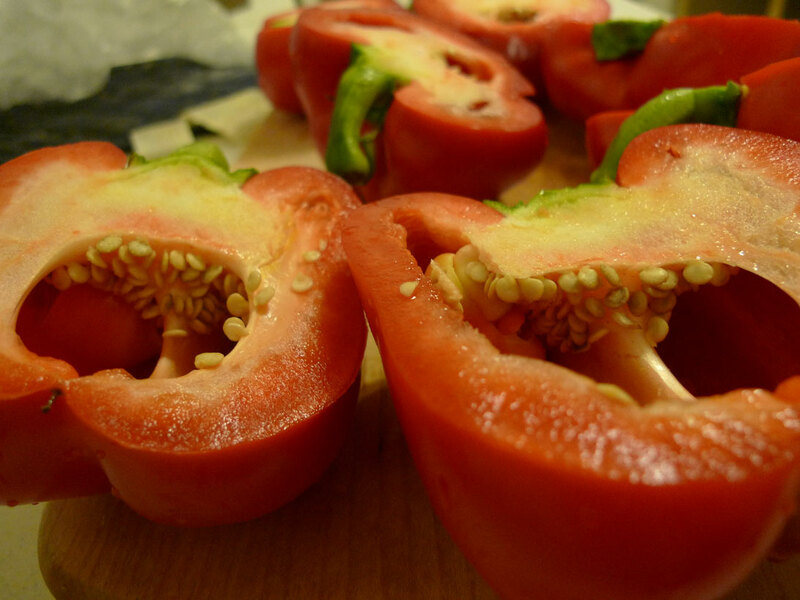 Cut the peppers in half lengthwise, through their stalks. Scrape out and discard the cores and seeds. Wash the pepper shells and pat dry with paper towels. 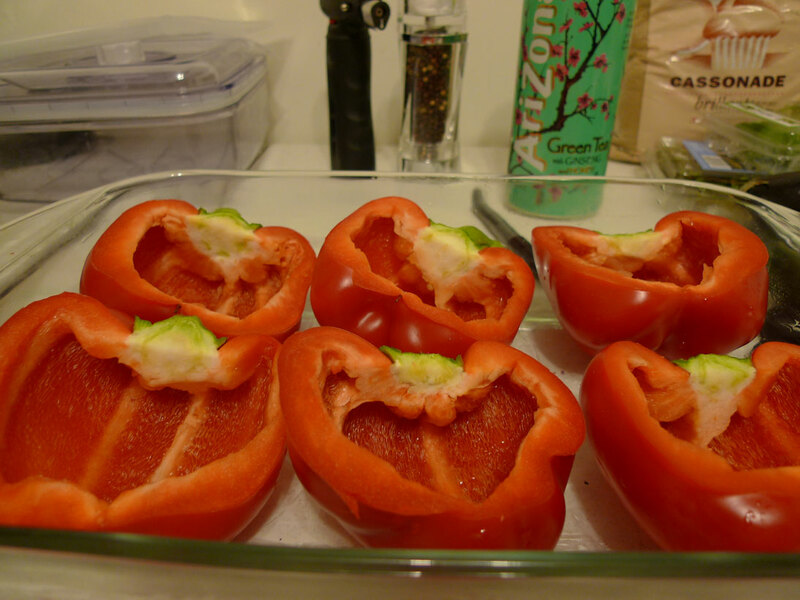 Put the peppers, cut-side up, in an oiled roasting pan. Divide the slivers of garlic equally among them and sprinkle with salt and ground black pepper to taste. 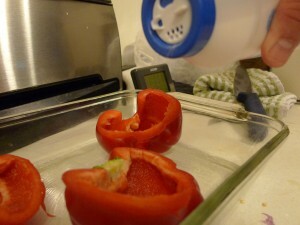 Then spoon the oil into the peppers and roast for 40 minutes. Using a sharp knife carefully cut each of the shelled scallops in half horizontally to make two flat discs. When cooked, remove the peppers from the oven and place a scallop half in each pepper half. 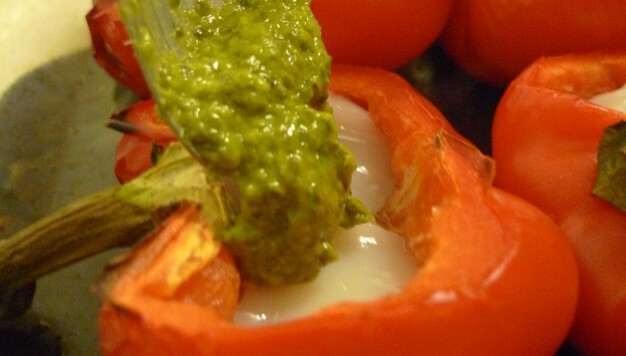 Then top with the pesto. Return the pan to the oven and roast for 10 more minutes. 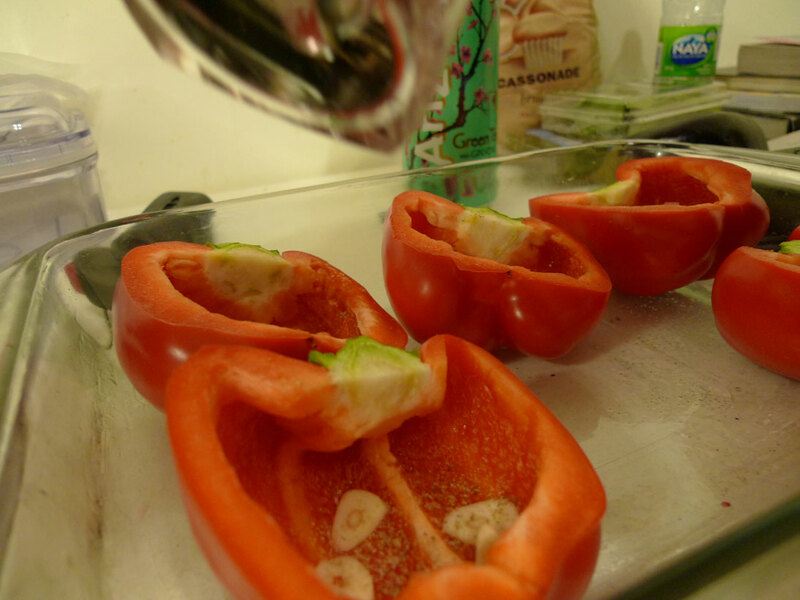 Transfer the peppers to individual serving plates, sprinkle with grated parmesan and garnish each plate with a few salad greens and basil sprigs. Serve warm. We had more scallops then we needed so we just stuffed the peppers with 2 scallops instead of one. Be sure the scallops are completely thawed (if using frozen ones) or your peppers will fill up with water as they thaw. Also be sure to not overcook the scallops or they will become tough and rubbery. Add a sliver of garlic..or two…or three…we like garlic! When ready, take them out. (careful…hot!). 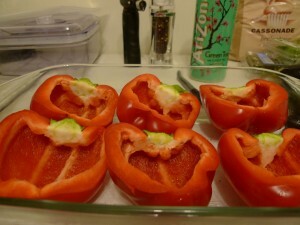 And place your scallop half in a pepper half. Garnish the plate so it looks pretty and dig in!